As presented at Maker Faire. 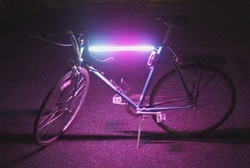 We set up a little system of RGB LEDs to spruce up your bike. 3D print files are on Thingiverse.